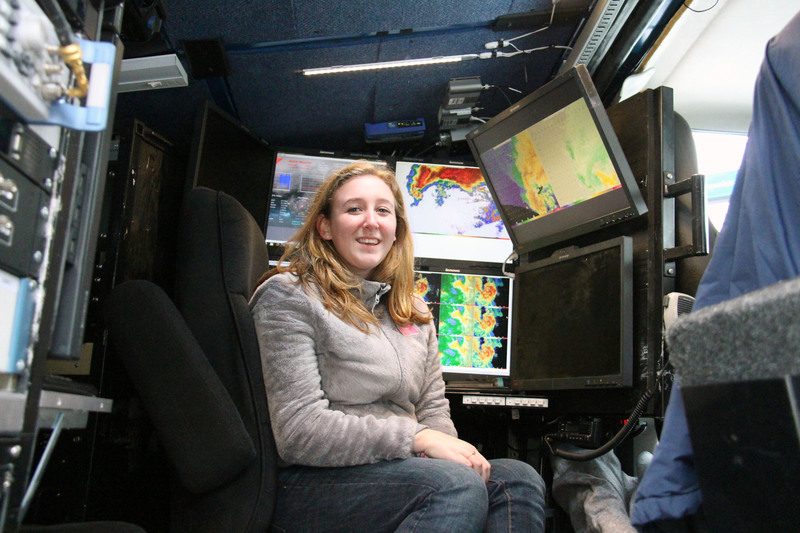 Scientists from the University of Utah, SUNY Albany, and the National Science Foundation brought their Doppler on Wheels to Pulaski High School for students to see how they study lake effect snowfall in the Central New York area. A group of students stopped for a photo following their tour and scientific observations of weather phenomena. While for most of us living in the Central New York region, it’s nearly an everyday occurrence during the early winter months and something we either take for granted or curse except when it means a snow day off from school. Peter Veals, left, one of the scientists with the OWLeS project and Cassie Chase, compare snowflake patterns identified on clipboards using small portable magnifying tools. But, to the scientists from the University of Utah and the University at Albany, it was probably the best place on earth to study lake effect. Dr. Jim Steenburgh, from the Department of Atmospheric Sciences at the University of Utah, along with other colleagues from several universities across the country joined with members of the Center for Severe Weather Research to study the unique aspects of lake effect in our region. The alignment of Lake Ontario, combined with the cold air coming across its waters from Canada, then meeting the higher elevations of the Tug Hill Plateau, creates the perfect spot to study the direct effects of lake effect snow. The scientists were thrilled with the extremely heavy bands of snow occurring across parts of Oswego, Lewis and Jefferson counties for the past several weeks. 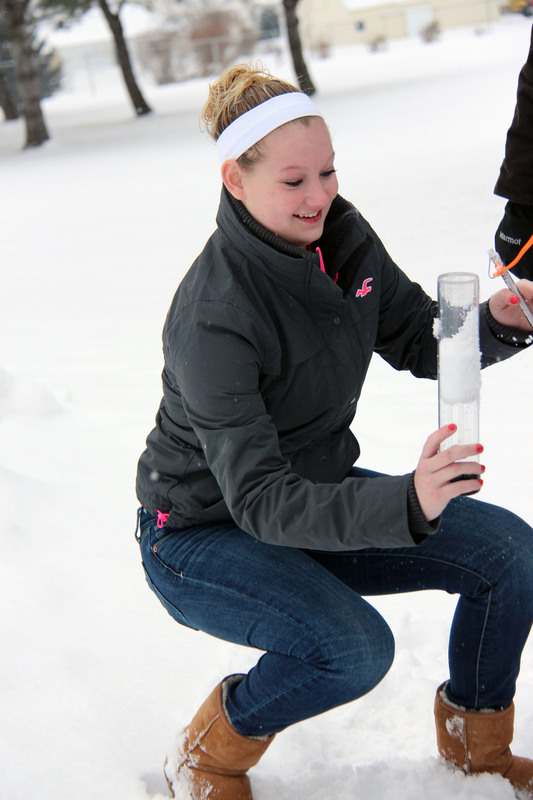 Lindsey Prye collects a snow total sample and later used a measuring device to weigh her sample. The group then used a mathematical formula to determine the water content of Prye’s snow sample. 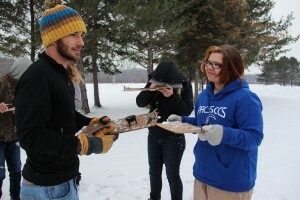 The scientists’ studies, which are part of an Ontario Winter Lake-effect Storms or OWLeS project supported by the National Science Foundation, looked at long-axis, short-axis and orographic components of lake-effect snow using a large variety of observation systems, one of which they brought with them for the students to experience firsthand. 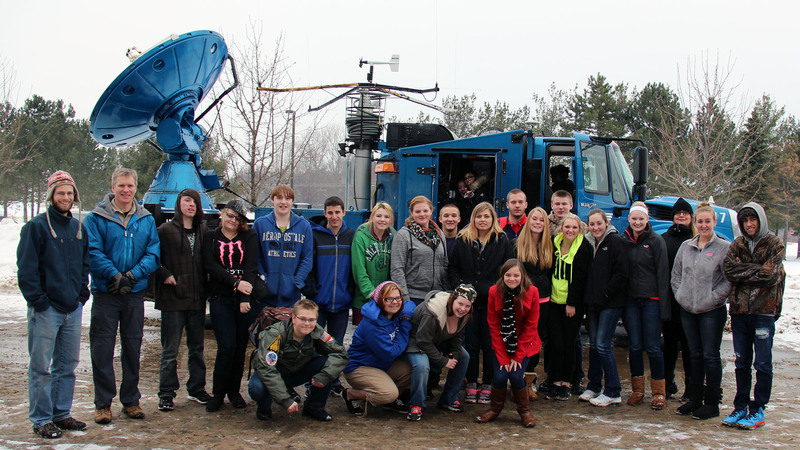 The large portable weather station know as Doppler on Wheels (DOW), was brought to the school for students to experience what it is like to sit in the cockpit of a state-of-the-art weather chasing machine. The scientists traveled 2,100 miles to Oswego County to study the lake effect and learn how topography affects it. They hope to develop better forecast capabilities and gain more lead time in predicting severe weather and storms. The scientists, who connected with teachers from the Pulaski High School science department through a conference earlier in the year, were more than happy to take some time to meet with the students at the school and share some of their knowledge and passion for meteorology. Kierstyn Glazier sits in the cockpit of the large Doppler on Wheels. After a brief introduction to meteorology and the study of snow, the students broke up into small groups to work closely with the traveling scientists to learn about how lake effect occurs, how to measure snow totals, how to determine the water content of snow, and take microscopic observations of individual snowflakes. The students took samples and using magnifying tools, examined individual snowflake formations during the class time. The groups also took a tour and learned about the function and capabilities of the DOW, before moving back inside where the scientists answered questions about a wide variety of weather-related topics.